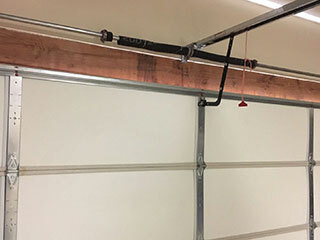 You'd be surprised how important the springs are to the proper functioning of your garage door system. Most people think the opener is what's in charge of supporting the weight of the panels and moving them, and while it does play an unquestionable part, the springs have a higher importance. They don't just support the weight of the door, they also provide a counterbalance for it, which helps you (or the opener) move the panels effortlessly. There are two different types that are in common use today. The first is the torsion spring, which is newer and more durable and flexible. Because units of this type use torque to generate the required tension, they are far less likely to whip around when they break, and are therefore considered safer. They need to be lubricated in order to stay functional, but they can end up lasting for a lot longer than their counterparts. Speaking of which, the second type is the extension springs; plural, because they're always installed in a pair, a unit on each side of the door. These units work by stretching and contracting, which makes them more susceptible to wear and tear, and their shorter longevity reflects that. While even attempting to adjust the tension of these units can be dangerous, replacing a broken spring is the epitome of the associated risks. You should never try to carry out this type of repair job yourself, as you could end up sustaining serious injuries. Not to mention, other parts of the door mechanism can get damaged in the process, which means you'll have to spend more money on repairs. Dealing with broken garage door springs is not something that homeowners should do themselves, unless they possess the proper training and have an adequate amount of experience. If you find yourself dealing with problems related to these units, all you need to do is give our team at Garage Door Repair Winter Garden a call and our experts will quickly make it over to you and handle everything. Can A Dented Garage Door Be Repaired? We are recognized statewide as one of the leading garage door repair and installation experts around. Our technicians have a host of experience and skills which they've cultivated over the past decade. We pride ourselves in our commitment to excellence and our same day service policy. If you're in need of any type of service related to these systems, you can count on our help. For more information, check out the rest of our website. Our technician will contact you before arriving. Until then, feel free to browse our website! Garage Door Repair Winter Garden is at your service!